Coletti outlines what a normal day for her is like and more. Time’s flying for Samantha Coletti at Army West Point. 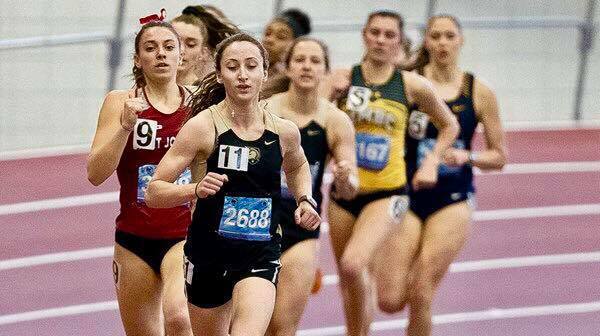 The Express chatted with Coletti, a three-season runner for the Black Knights, about her experiences thus far and to find out where she hopes to end up. Q: How would you describe your college experience in general thus far? Q: For those who don’t know, what makes West Point unique? Q: Why West Point? What made this the right fit for you? Q: What’s a normal day like for you? Q: How do you balance being an athlete and student? Q: What’s been the best advice you’ve received about being a student-athlete and who did it come from? Q: What’s been your greatest accomplishment as an athlete so far? When did it come? Q: What’s been your greatest accomplishment off the field so far? When did it come? Q: What are your goals the rest of the way? Former W-H basketball standout Sean Leahy is starting to find his rhythm for UMass Dartmouth. Sean Leahy couldn’t have scripted a better way to head into the winter break. In UMass Dartmouth men’s basketball’s final game of the semester, the 6-foot-5, 180-pound freshman forward from Hanson got his second start and erupted for a career-high 17 points in a 90-75 victory over Tufts on Dec. 10. “He shot the ball well from the perimeter,” UMass Dartmouth head coach Brian Baptiste said. Leahy connected on five of seven field goals, which included an 80-percent showing (four of five) from beyond the arc. The outing earned him Little East Conference Rookie of the Week honors in men’s basketball. It’s been a work in progress this winter for Leahy, who’s battling back from two broken wrists. 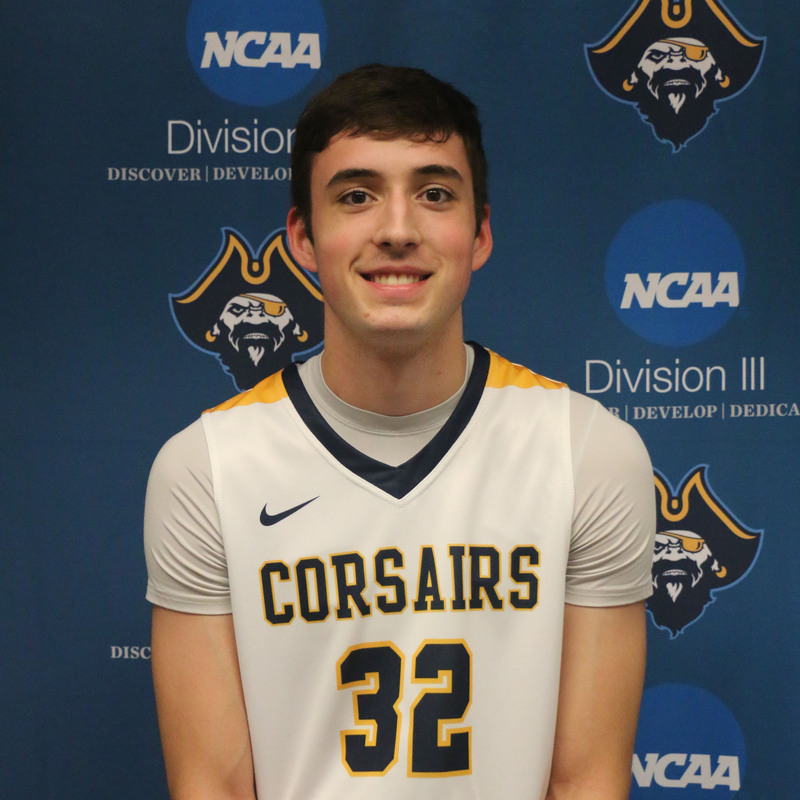 In the Corsairs’ first six games, Leahy averaged just 13 minutes per game, but over their last four outings he’s averaged 31.5 minutes per contest, including back-to-back starts. Leahy, a nursing major and the 2017-18 Patriot League Keenan Division MVP, said the adjustment to the college game has been a battle, for sure. However, he’s using a few lessons learned at the high school level in his adjustment. Baptiste said Leahy’s top asset is his understanding of the game. Leahy said he’s going to spend a majority of his break in the gym before the 7-4 Corsairs resume play Jan. 3 against Becker. “I’m looking to get a little stronger so I can hang in the paint with those bigger guys, but that’ll take time,” he said. Baptiste said he’s looking forward to what the next three and a half years will bring for Leahy. “I expect him to be an outstanding player for us,” said the coach. Ari Comendul convereted to a midfielder for her senior season. All Ari Comendul could do was watch. 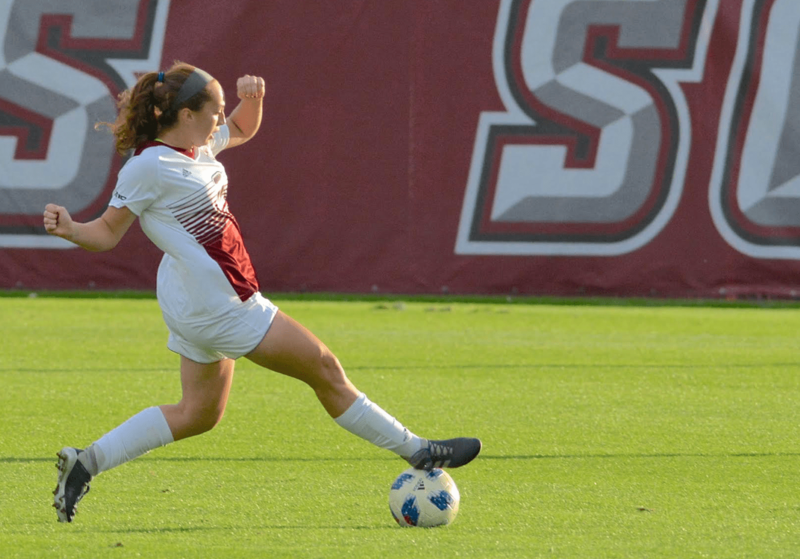 After her first three seasons on the UMass women’s soccer team, she received zeroplaying time. “I had a lot of trouble breaking through that starting [goalkeeper] position,” said Comendul, who hails from Whitman. The constant commitment to practice, with no results to show for it, began to take a toll on her. Not playing was uncharted territory for Comendul, who, as a senior and the starting goalkeeper, helped lead the Whitman-Hanson Regional High girls’ soccer team to the Div. 1 state finals in 2014. But a position change was anything but new to her. She didn’t step into goal until the middle of her junior season in high school, when she converted from forward. So, with experience as a goalkeeper and forward stemming from high school, Comendul made the switch to midfielder this past spring in advance of her senior season at UMass. First-year Minutewomen head coach Jason Dowiak was the one who suggested the move. After playing half the game in the field at first, she received significant minutes in UMass’ final spring bout against Holy Cross. Dowiak said Comedul’s position change shone a light on two of her best attributes: unselfishness and leadership. “She’s willing to kind of play whatever rolethe team needed,” he said. “I think she set a great tone for the mentality of the ‘Do what’s best for the team.’” Comendul didn’t just make the switch, but she was pretty effective as a field player as well. The biochemistry and molecular biology major played 278 minutes and had a goal and an assist on the season for UMass, which finished 11-6-1, surpassing the 10-win mark for the first time since 2011. Comendul said at times she felt like a freshman during the transition. “My positioning was off a lot of the time, and it kind of just hit me one day that, ‘I need to stop trying to become a midfielder and just start being one and adopting the mentality of the position,’” she said. Dowiak said it was Comendul’s intelligence, both on and off the field, that allowed her to succeed in the switch. When all was said and done, Comendul said she’s forever thankful she continued stick it out through the difficult times. Stay up to date with the Whitman-Hanson Regional High alumni playing at the next level. With the winter season at the college level in full swing, it’s time to look back on how the Whitman-Hanson Regional High alumni did during the fall. Nick Villanueva(Curry) – Junior from Hanson led the Colonels’ receiving corps with 655 yards and six touchdowns, and he ranked second with 50 receptions en route to being named to the second-team All Commonwealth Coast Conference. Sam Coletti(West Point) – Junior from Whitman finished at 23:00.7, the fourth fastest on the team, to spark the Black Knights’ fifth-place finish at the Patriot League Championships on Oct. 27. Abby Newman(Bentley) – Junior who hails from Hanson finished 26thwith a time of 21:19 in the Shacklette Invitation on Sept. 1. … Also finished in the top 75 on Nov. 4 in the Northeast Championships. Anthony Pasciuto(Keane State) – The Abington native started 12 games, posted six shutouts and a 9-4 record in his freshman campaign. Katie Amado(Massasoit) – Amado, a Whitman resident, started 12 games in net, and she recorded four shutouts and 56 saves. Lauren Bonavita(UMass, Amherst) – Freshman tied for a team-high seven goals and added five assists. … Hanson resident was selected to A-10 All-Rookie Team. Betty Blake(Massasoit) – Freshman defender from Whitman ranked third on the team with 12 goals, and she dished out seven assists for a total of 31 points. … Had hat tricks both on Oct. 4 against Quinsigamond Community College and Oct. 16 against Bristol Community College. Ari Comendul(UMass, Amherst) – Senior from Whitman scored a goal and recorded an assist. Alexis Fruzetti(Southern New Hampshire) – Junior transfer from Duquesne scored four goals, two of which came in a 2-1 victory over Merrimack on Oct. 4. … Hanson native scored her other two in a 4-0 victory over Le Moyne on Sept. 8. Rachel Kelly(Regis) – Junior from Whitman scored six goals and dished out three assists for a 15-point junior season. Taylor Kofton(Boston University) – Norton native scored four goals to go with two assists during her freshman campaign. Eve Montgomery(Manhattan) – Freshman who hails from Abington scored her first collegiate goal in a 2-0 victory over St. Peter’s on Sept. 29. Brooke Newcomb(Massasoit) – Freshman from Whitman passed for four assists, three of which game in a 3-0 victory over Springfield Technical Sept. 22. Alex Santos(Massasoit) – Sophomore Hanon resident ranked fourth on the team with nine goals to complement nine assists. … Scored five times in a 13-0 victory over Bunker Hill on Oct. 3. Amanda Sesock(Massasoit)– Sophomore, also from Hanson, ranked fourth behind her two former high school classmates in goals with seven. … Also added seven assists. Halle Julian(Eastern Nazarene) – Freshman from Whitman ranked second on the team in blocks per set (0.51) and third in both kills (111) and hitting percentage (.257). Jordyn Keith(Curry) – Sophomore, who is also from Whitman, played in a co-team-high 88 sets and posted 234 digs, good for third on the team. Halle Julian earned an extend role in her freshman season at Eastern Nazarene College. Coming into the season, Whitman native Halle Julian had two ways to measure success in her freshman campaign on the Eastern Nazarene College women’s volleyball team: individual improvement and team accomplishment. She can check off both of those boxes. “It was just an awesome experience and I couldn’t have imagined a better freshman year,” she said. The 2018 W-H grad made an impact immediately for Eastern Nazarene, which advanced all the way to the New England Collegiate Championship this season, where it fell to South Vermont, 3-1. The Lions’ final record was 20-7, a significant improvement over their 11-19 campaign in 2017. In her first season with the Lions, Julian, a middle hitter, saw action in 79 of the squad’s 93 sets; she ranked second on the team in blocks per set (0.51) and third both in kills (111) and hitting percentage (.257). 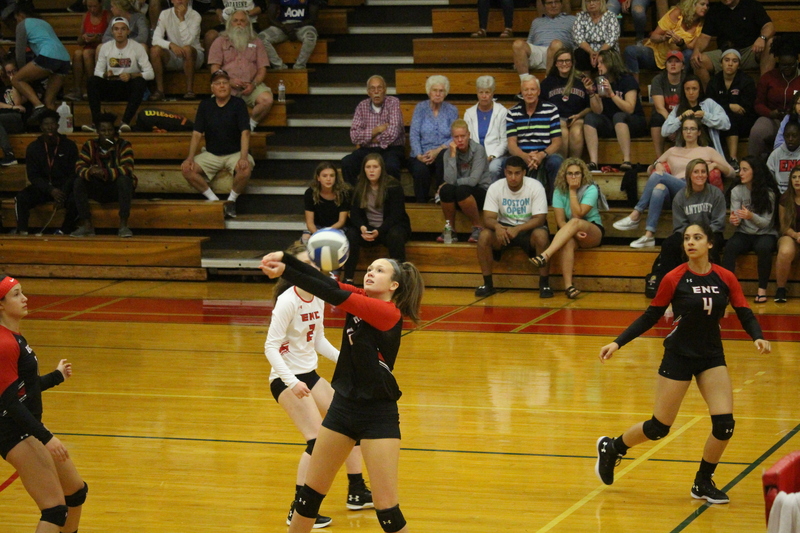 “For a freshman to come in and put up those kind of numbers in the first year of being a college player is pretty good,” said Eastern Nazarene women’s volleyball head coach Derek Schmitt. Schmitt said Julian’s consistency on the court is why she saw significant playing time as a freshman. Schmitt said he was surprised Julian cracked the learning curve that comes with being a freshman so quickly to make an impact right away. Julian credited her time playing for former W-H girls’ volleyball head coach Josh Gray as having a major impact on her. “He taught me how to play the game I do today,” Julian, the Panthers’ all-time blocks leader on record, said. Julian’s best match statistically this season came Oct. 11 against Gordon College; she registered a career-best 11 kills and swatted seven blocks. Julian said she’s already been in the gym as she strives to make an even larger impact for the Lions next fall. Lauren Bonavita, of Hanson, put forth seven goals in her freshman campaign, which was tied for the team high. 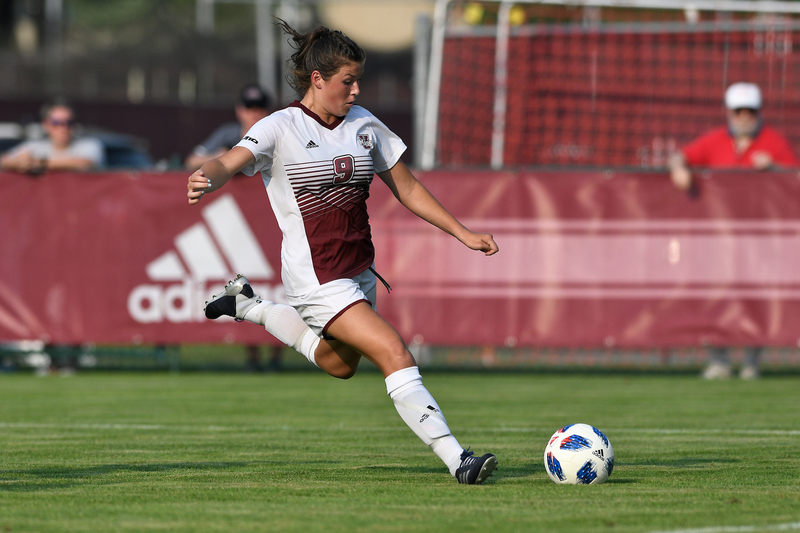 When Jason Dowiak was announced head coach of UMass Amherst’s women’s soccer team last December, Lauren Bonavita was the first person he called. Since Dowiak had not recruited the incoming class, he needed to find out more about the team’s incoming freshmen. Dowiak had a solid idea of just what Bonavita, coming off a 43-goal season and 113-goal soccer career at Whitman-Hanson Regional High, would bring to the team – a dynamic scoring presence. Further game footage sent over by Bonavita affirmed his thinking. During the spring, Bonavita, who hails from Hanson, impressed him, while playing for her club team FC Boston. “I think out of four or five spring games that we watched her play, only one of those games did we walk away saying ‘Ah, we kind of expect more,'” Dowiak said. “All of the other games she was the best player on the field and it wasn’t even close, and she was scoring a boat load of goals. I think in a matter of seven or eight club games last year she had 13 goals and 13 assists. “And we were tracking, we started watching and we were like, ‘OK, so she had two or three that game. She had three in this one and then she only had one goal in this game but she had three assists. Obviously we started getting really excited of what she’s capable of.” When the fall arrived, that goal scoring was on full display for Dowiak’s Minutewomen and played a key role in their turnaround. Bonavita tied for a team-high seven goals and added five assists as UMass went 11-6-1. It marked a four-win improvement on 2017 and the team’s first season above 10 wins since 2011. In the Minutewomen’s opener against Maine, Bonavita set the tone of the fall in the 36th minute with the first goal of the season. “It was very, very exciting,” she said. In the first four Atlantic 10 games, Bonavita notched a goal and two assists  including the winning pass in a 1-0 victory over St. Bonaventure on Sept. 27. Thanks to this, UMass began conference play 4-0 for the first time in over 10 years. Bonavita said the most important thing she learned at W-H that translates into the college level is conditioning. “Our fitness with coach [Dave] Floeck would be the two-mile run in the summer and just making sure you’re working throughout the sum mer to get your fitness up,” she said. Bonavita also noted competing in a rigorous Patriot League throughout high school helped her to compete at the next level. Thanks to her strong performance this fall, Dowiak said he is excited to watch Bonavita’s growth over the next three seasons. “I think that we’ve got an amazing player on our hands that we can really develop into someone that can come out and be productive against just about anybody,” Dowiak said. 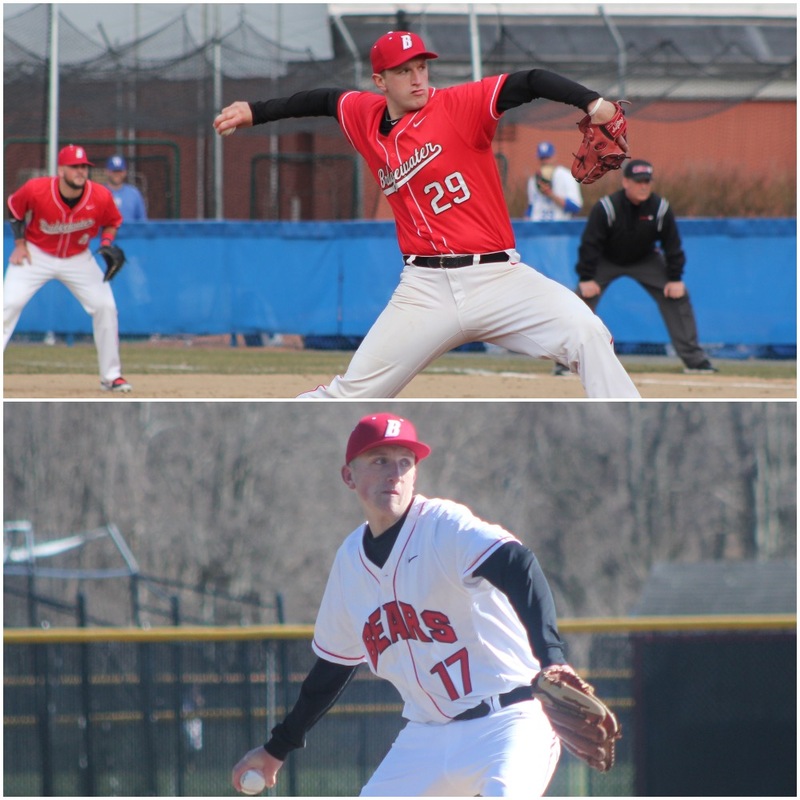 Brothers Colin, a junior, and Matt Josselyn, a freshman, both of Hanson, joined together to play baseball for Bridgewater State University this season. When freshman Matt Josselyn of Hanson decided he no longer wanted to attend the University of New Hampshire, he knew right where he wanted to go. With his brother Colin, a junior, attending Bridgewater State University, it seemed like the perfect fit. “He had a big impact just to go somewhere where I was more comfortable and had a way in at the school, with my brother being there, was very influential,” Matt, who transferred to the school this semester, said of his older brother. The move certainty grew their relationship, which already was close. “He’s over almost every day to play video games and relax,” Colin said of Matt. Not only do they share the same couch and television on occasion, but they rep the same Bears uniform out on the diamond as well, and it’s been a special season for them both. The brothers — despite their ties — didn’t get to play much competitive baseball at all growing up together due to the near two-year age gap. All they had was a season of fall ball and a summer of Legion ball together, and Matt wasn’t ready to advance to the varsity level at Whitman-Hanson Regional High until after Colin graduated. Bridgewater State head coach Rick Smith said having the Josselyn brothers — who are both pitchers — on his club adds a sense of family in the team dynamic, and he likes it. For Colin, last year was tough as he suffered a season-ending labrum tear in his throwing shoulder before the Bears’ annual season-opening trip to Florida. In his return to the bump this season — which came March 6 against Eastern Nazarene — he was lifted after 5.2 innings. With a runner on second base and two outs, there was a call to the bullpen for his younger brother Matt. Colin said when he saw his younger brother warming up between innings, he tried to give him a jolt of confidence. “I just said, ‘Hitters aren’t as good as you think they are. I know it’s college and they’re probably a little better [because] your above-average high school players are playing in college. But, you’re an above-average high school pitcher so just go out and do you,’’’ Colin said. Matt fired 1.1 scoreless frames in relief. Colin said he’s used his little brother as motivation for some time now. Having an older brother who grew up as a talented baseball player certainty had its benefits to Matt. Since that outing, both Colin and Matt have seen action in three games apiece and shared the hill April 11 against Curry. 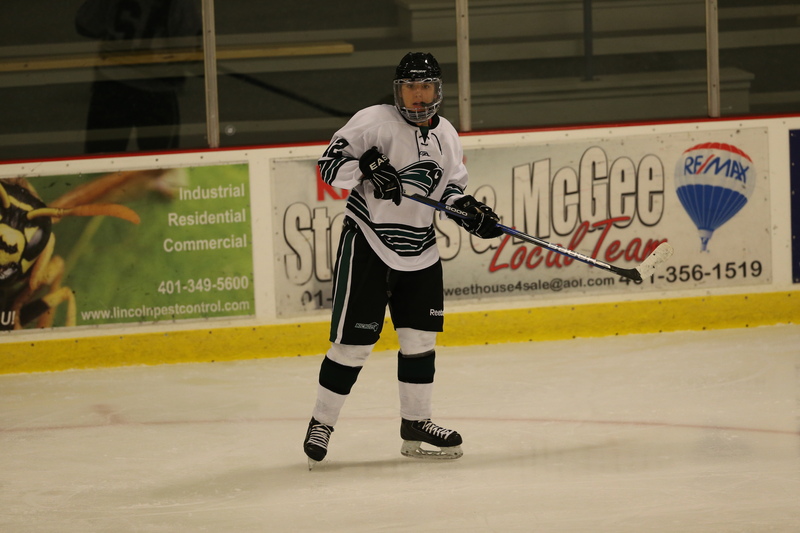 Mel McAleer, a Hanson native, is impressing on the ice at Nichols College. Mel McAleer is no stranger to success. At Whitman-Hanson, as a member of Pembroke/Whitman-Hanson (2013-14) and then Whitman-Hanson/Silver Lake (2014-17), her teams boasted a 53-26-7 record and cracked the Division 2 tournament each season. During that span, McAleer registered 114 goals and 73 assists. Now, she is carrying over that success at Nichols College. It took McAleer, a Hanson native, all but 6:55 into her first collegiate contest to find twine. At the 13:05 mark of Nichols College women’s ice hockey’s season opener against SUNY Canton on Nov. 3, Kelly Ferreira passed to Jordyn McGuire who fed the puck to McAleer and she skated a few strides and buried a shot far side for a power-play goal, pushing the Bison up 2-0. The tally, which turned out to be the game-winner, came 49 seconds after McAleer dished out her first collegiate assist on a goal scored by McKenna Gernander. Since that first tilt, McAleer has nine goals and 11 assists and had been tabbed Colonial Hockey Conference Rookie of the Week twice. McAleer’s most recent honor came Feb. 4 after she tallied four points (two goals, two assists) in 5-2 win over Neumann the day prior. Not only was it a career day for the freshman, but it was a record-setting contest for Nichols, as it set a regular-season wins mark with nine. McAleer’s path to the Bison is a unique one. She was actually recruited by former head coach Wil Brown, who stepped down, and was succeeded by former University of Maine women’s ice hockey assistant Mike O’Grady. “I touched base with Mel when I got the job and she was in and said she was coming, so we kind of just went from there,” O’Grady said. McAleer said the biggest adjustment from the high school to college level has been the speed of the game. “Passes are much crisper and come much faster,” she said. While at Whitman-Hanson, WHSL head coach Kevin Marani always raved about McAleer’s speed, but O’Grady said he’s seen her develop in other facets of the game as well. “I think the other part that has come along is her ability to see some lanes, [and] not only put the puck in the net, but also give the puck,” O’Grady said. “She’s gotten better with some patience and the speed of the game and just the way things happen and reading lanes and more of some of the intricacies that come into the college level, playing within a system and understanding how to play within a system and how it can continue to help her be successful in putting the puck in the net. McAleer said the key to success at the collegiate rank is simply just competing for your teammates. McAleer, whose pregame ritual consists of putting on her headphones and imagining herself making plays from a fan’s perspective, said fully intends to finish out the campaign strong. W-H alum Jordyn Keith, seen at a recent practice session, earned a starting spot in the season-opener vs. Fisher College on Sept. 1. Her goal for next season is to work on her strength and speed. / Courtesy photo: Curry College Athletic Dept. 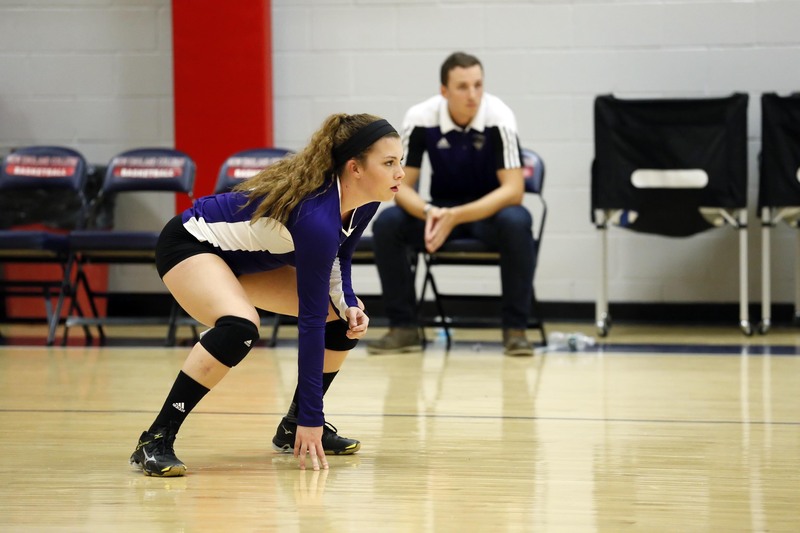 Whitman-Hanson alum Jordyn Keith is the only freshman starter on Curry College’s women’s volleyball team. It was three years ago when members of the Whitman-Hanson Regional High girls’ volleyball team took a trip to Curry College to soak in a few sets as spectators. One of those on the adventure was then-sophomore Jordyn Keith, who immediately fell in love with the campus. She then went home, did some research, before ultimately applying. After getting in, she soon received an email from new Colonels head coach Bori May, asking her to attend preseason on a tryout basis. After a week of play, she was penned on Curry’s women’s volleyball roster. As if making the team was not enough excitement for Keith, May tabbed her as a starter ahead of Curry’s season opener against Fisher College on Sept. 1. That was something she never expected. Keith – the only Colonels freshman starter – finished the season with 69 kills, 12 assists, 52 service aces and 181 digs to her credit. Keith said one of the struggles she faced this fall was a position change, something she was no stranger too. As a senior at Whitman-Hanson, she was shifted from outside hitter and defensive specialist to libero, where she flourished, leading the Patriot League in digs and aces. At Curry, the 5-foot-4 Keith saw action as not only a libero, but as an outside hitter and defensive specialist as well. “I had to adjust to hitting and blocking which isn’t easy, but I’ve improved since I began hitting on the team,” Keith said. Another struggle Keith endured is just mustering up enough confidence to go out and compete against some of the wily veterans she goes up against. Her solution: try to smile and think positively, no matter what. Former Whitman-Hanson Regional High girls’ volleyball head coach Josh Gray, who coached Keith for three years on varsity, said he’s seen her grow her game immensely. Gray said Keith’s dedication to her craft has played a major role in the player she is today. As Keith heads into the offseason, she said she is going to keep doing the things that got her to this point. Hanson native Billy Sweezey has been a standout for Yale’s men’s hockey team. Commitment, confidence, grit, poise, resolve and wit. All are on full display when you watch Yale men’s hockey defenseman Billy Sweezey skate. The Hanson native just concluded his inaugural campaign on the ice for the Bulldogs. He coined it his “most fun” season yet. The 6-foot-2, 204-pounder appeared in all 33 games for Yale, scored a goal, notched five assists and led the club with a +13. Sweezey’s path to one of the oldest schools in the nation is an interesting one. After beginning school and high school hockey at Archbishop Williams, he transferred to Noble and Greenough, repeated his sophomore year and played three seasons there and was honored as a captain his senior campaign. After Nobles, he decided to take a year off from school and competed in the United States Hockey League for the Chicago Steel. In the midst of all that, he committed to Yale as a junior in high school. Sweezey said one of the toughest shifts to the collegiate ranks he was tasked with was not on the ice. Sweezey said everything on the ice went relatively smooth after he was able to work diligently with his coaches to get past the adjustment period. One aspect Sweezey said he prides himself on is his physicality on the ice. However, it can be a detriment at times, and caused a few issues at the early stages of the season. Though, he was able to figure out how to become more disciplined, which can be seen by a season-best sixgame no penalty streak from Jan. 13 to Jan. 28. The rising sophomore said when he reflects back at his 2016-17 campaign, one moment that comes to mind is Yale’s 3-2 overtime win over Dartmouth in the first round of the ECAC playoffs on March 4. In the triumph – the Bulldogs’ last home tilt – Sweezey netted a third-period assist that knotted the score at 2-2. Sweezey, who went through the Hanson School System up until high school, said he looks forward to the offseason for a bevy of reasons.